[UPDATED] USA 276 (the NROL-76 payload) and the ISS near DRAGON CRS-11 berthing. Five days ago I wrote about the odd NROL-76 payload, USA 276, which was launched as NROL-76 for the NRO by SpaceX on 1 May 2017. In that post I pointed out that its orbit was peculiarly close to that of the International Space Station ISS. 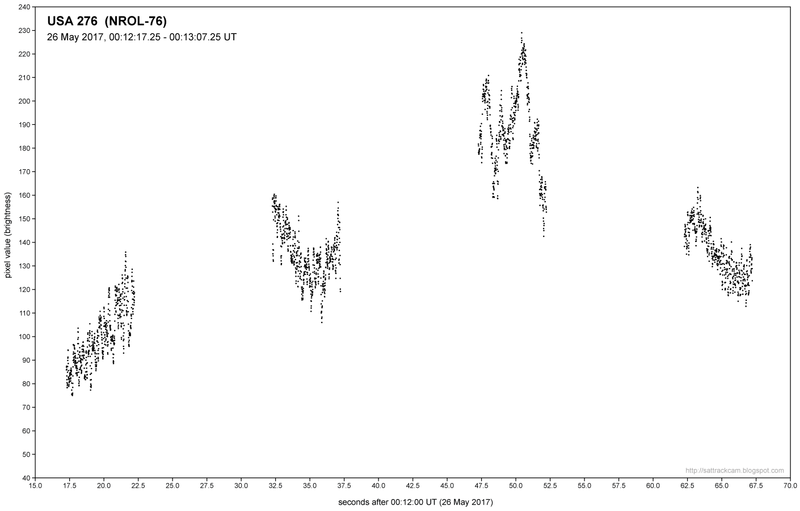 I have prepared two animations to show the extend of this, and what will happen in the first week of June if USA 276 does not change its orbit before that date (this is an important caveat!). Note how the satellite is effectively circling around the ISS, at close range. Again, and I can't say this enough: this will be the approximate situation if USA 276 stays in the orbit we currently have for this satellite, and does not manoeuvre. In terms of the closest approaches, these happen the day before the CRS-11 berthing. While I admittedly go out on a limb here, this idea does not come out of the blue. China and Russia have been busy practising such berthings and (very) close approaches in space with dedicated satellites disguised as space debris the past 10 years, which has the US military worried. Is the technology demonstrated by USA 276 perhaps meant to test whether such events can be observed (either optically, with radar, lidar, or whatever technology) from close by, to determine in detail what is going on? It would be incredible (and politically sensitive) to use the International Space Station as a test subject in this way, which is why I and others are hesitant to accept this idea. On the other hand, the ISS is there and you get frequent dockings and berthings of DRAGON's, PROGRESS, SOYUZ and HTV to watch for free, objects you don't have to launch yourself (saving development and launch costs and time. Launching a bunch of satellites for this purpose also atttracts attention, as the story with the Russian satellites shows). I still don't know what to think of this all. Are these figments of my imagination or is there really something going on here? I am at a loss. Opinions are welcome. The positions of DRAGON CRS-11 in the animations are based on elsets of DRAGON CRS-10 relative to those of ISS at the time, and (for the 3 June animation) are less certain than the ISS and USA 276 orbital positions. The issue of launch windows and orbital plane shifts was rightfully raised on e.g. the NASA Spaceflight forum. It is true that the launch time needed to target the ISS orbital plane shifts by ~20 minutes each day. The crubbed launch on April 30 targetted 11:15 UT, the same time as the eventual launch a day later. Curiously enough, the Area Warning given out before the launch does open 20 minutes earlier, at 10:55 UT. Very confusing (and I initially goofed with that in a comment on the NASA Spaceflight forum). It should be noted that USA 276 of course isn't in the exact plane of ISS (there is a 1.6 degree inclination difference anyway). A small difference in RAAN does not matter that much in this situation, it transpires. 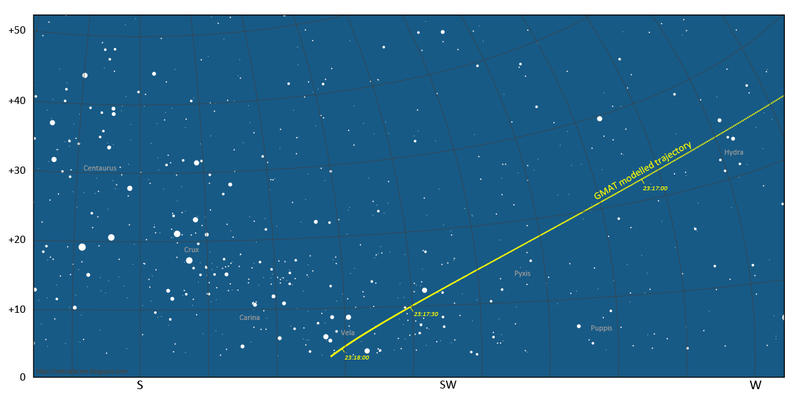 I have looked into the effect would NROL-76 have actually been launched at 11:15 UT on April 30, when the launch was scrubbed. 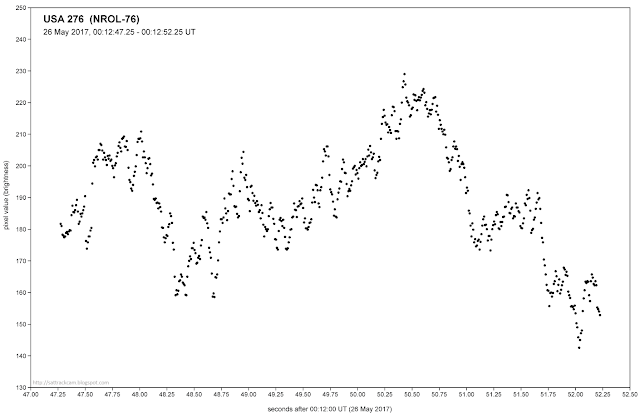 The effects of a fixed launch time at 11:15 UT rather than a daily launch time shift to match the plane crossing time are actually not that large, it turns out. To investigate the effect, I adjusted the RAAN of the current orbit accordingly to match launch on 30 April, 11:15 UT..
USA 276 actually then would have made even somewhat closer passes to the ISS (to minimum distances less than 15 km on June 3 near 18:44 UT), but with the approach times some 4 hours shifted compared to those for the actual launch date. 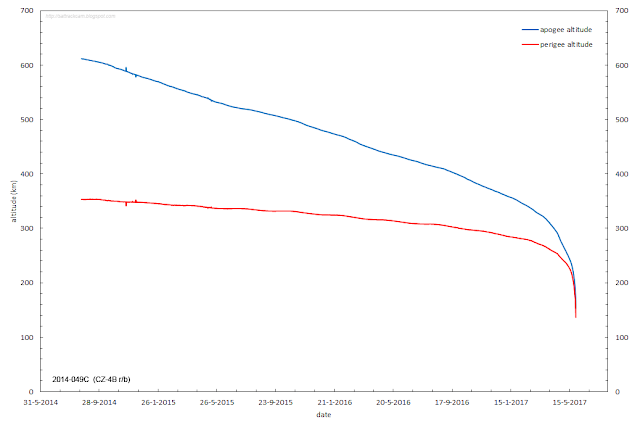 During CRS-11 berthing on June 4, it would actually have been somewhat closer too, although with all other parameters of the orbit kept equal the time of approach would not match so neatly with berthing. These are not things that cannot be solved by a small manoeuvre however. 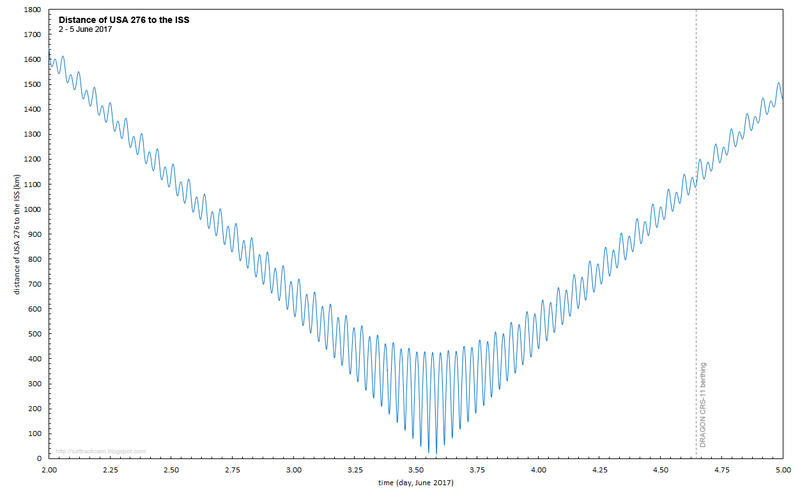 After updating the orbit of USA 276 with observations from last night, the time of closest approach has shifted a bit to an earlier approach instance (14:01:53 UT, June 3) and to a slightly smaller nominal distance (~18 km). The overall scenario remains the same, its details that change. It will be interesting to see whether the schedule will change with new orbit updates, now the launch of DRAGON CRS-11 has been postponed to June 3. In a post on SeeSat-L, Ted Molczan has summed up the pro's and con's of the conjunction between ISS and USA 276 being coincidental or not. Like me, he does not really know what to think of it. The beautiful, spectacular images of a rocket stage re-entry above were made by the Dutch aviation photographer and pilot Christiaan van Heijst, the co-pilot of a Cargolux freight aircraft (flight CV760, a Boeing 747-8 with registration LX-VCC) en route to Brazil on May 27, 2017. Suddenly I noticed something in the corner of my eye. I looked to my right and to my own surprise I saw a huge group 7-10 of bright yellow lights move parallel to our track with a much faster speed and very high altitude. This was not an airplane, nor was it a meteorite. 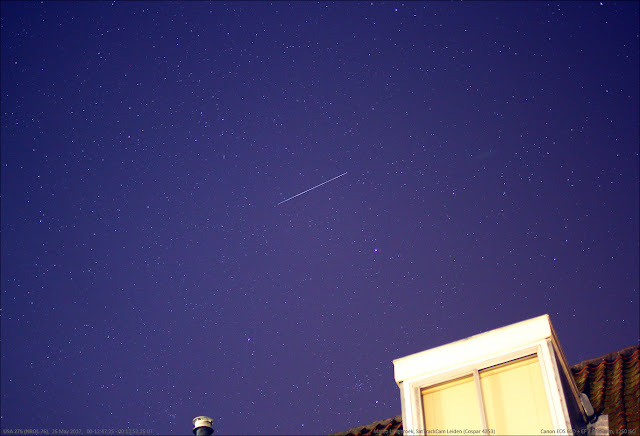 Where shooting stars / meteorites often leave a bright trail, they move with very high speed and burn up quickly. This cluster of lights moved far too slow to be a meteorite and its light was far too constant to be an ordinary meteorite. Immediately, a lot of excited chatter in Portuguese and other (African) languages I could not identify. was opening up on the frequency we had tuned in. 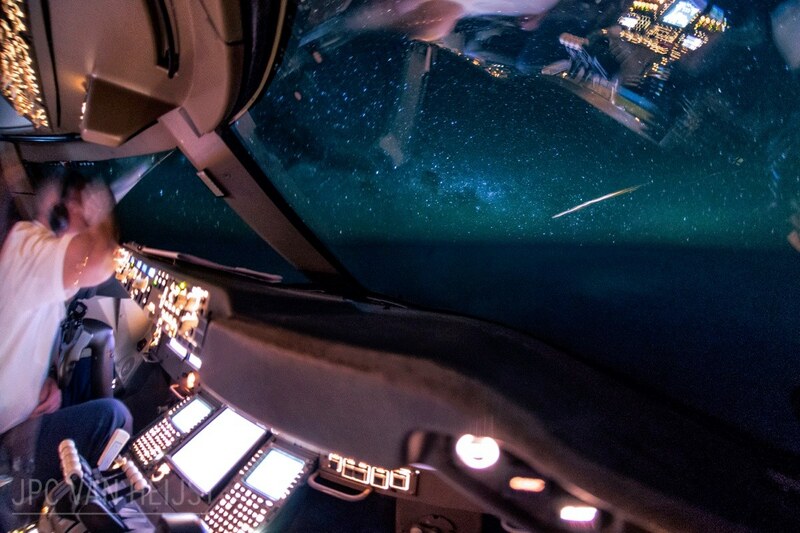 Apparently lots of pilots were seeing the same lights, which is not surprising with such a high and bright appearance. All in all, the lights appeared abeam our aircraft and disappeared on the horizon in roughly two minutes time, keeping their intensity and appearance along the way. Evidently, what Christiaan and his colleagues were witnessing was a spectacular re-entry of space debris, with the re-entering object breaking up in multiple pieces while it was plunging through the atmosphere. 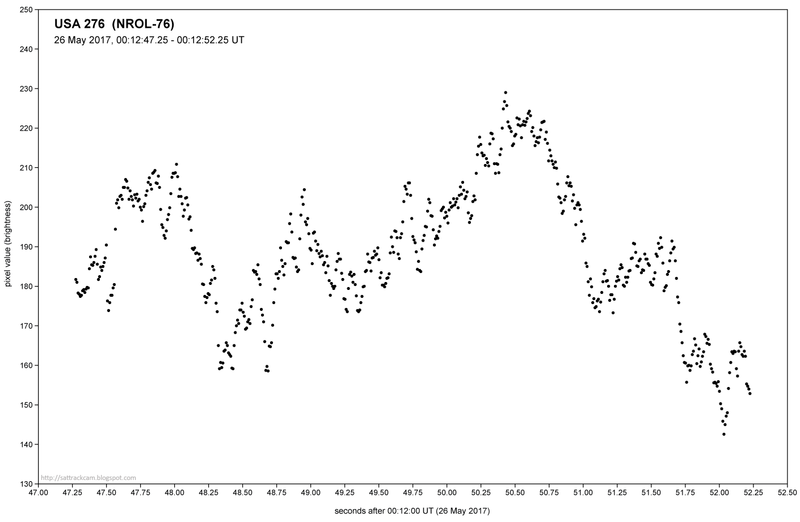 The time of this re-entry event was around 23:18 UT on May 27, 2017, while the aircraft was over the mid-Atlantic near 11o.93 N, 33o.28 E (see also later in this post). In this blog post, I identify the object responsible and provide some model results for this re-entry. Christiaan van Heijst initially thought that this re-entry event was related to a NOTAM issued mid-May, a warning for the splash-down of a Soyuz 2nd stage during the SES-15 launch from Kourou. This launch however had already happened 10 days earlier, on May 18, so evidently was no explanation for this event. Christiaan next posted his story on Facebook, hoping that someone could identify the object responsible. I was allerted to Christiaan's Facebook post by one of my Twitter followers, Theo Dekkers and could quickly identify the event as the re-entry of 2014-049C, a Chinese Chang Zheng (Long March) 4B (CZ-4B) upper stage from the launch of the Chinese Gaofeng 2 and Polish Heweliusz satellites in August 2014. Time, location, and movement of the witnessed event agree extremely well. Two days before the sighting, JSpOC had started issuing TIP (Tracking and Impact Prediction) messages for this object via their Space-Track portal. 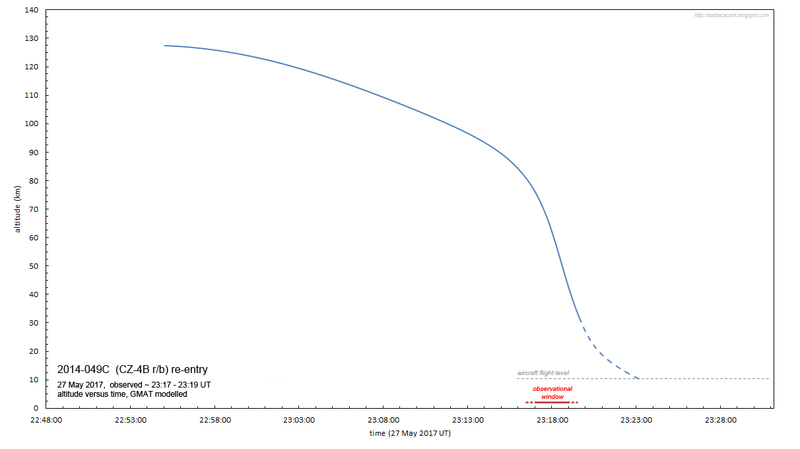 The final TIP message, issued after the actual re-entry, lists the re-entry time as 27 May 23:17 +- 1 min UT, near 15o.7 N, 34o W (by the way: we actually believe that such times accurate to 1 minute originate from infrared observations of the re-entry fireball by US SBIRS early warning satellites). This time and position closely agrees with the observations of the aircraft crew and the aircraft position. 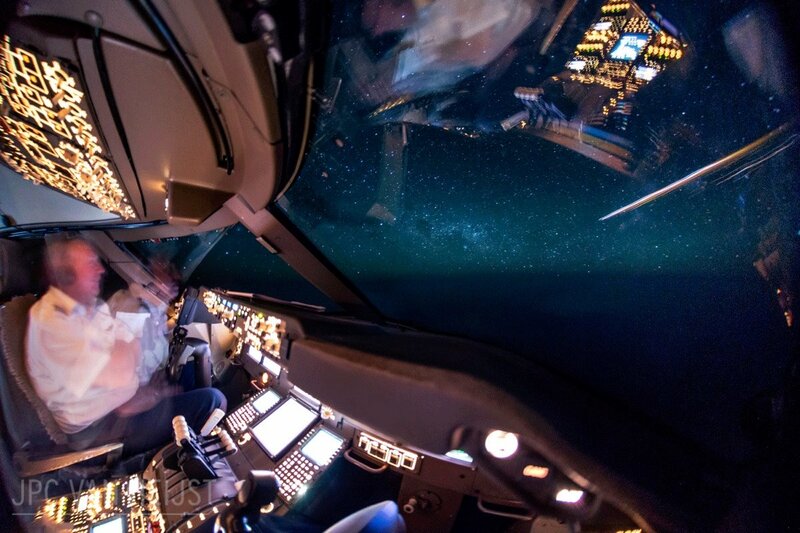 Christiaan van Heijst provided me with a photo of the aircraft flight instruments taken about one minute after the event. 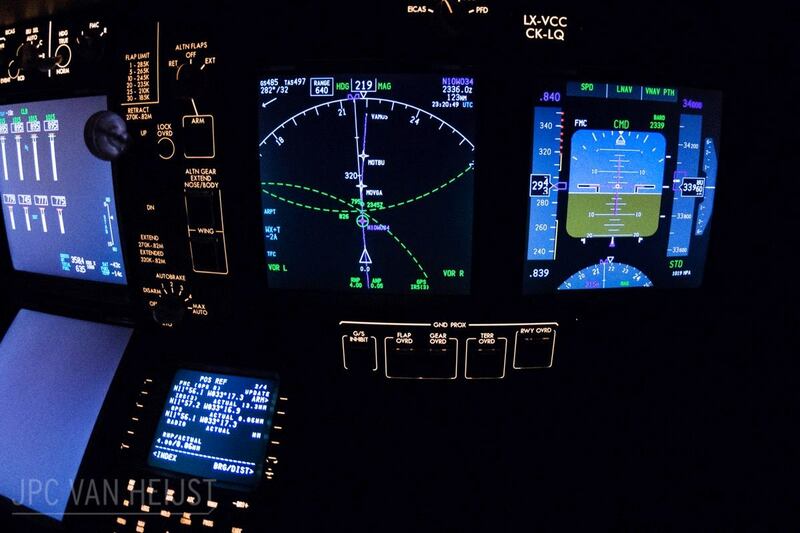 It shows the time of that moment, 23:20:43 UT, and the aircraft's GPS coordinates and altitude: 11o 56.1' N (11.935 N), 33o 17.3 W (33.288 W) at a flight level of 34 000 ft (10.360 km). [edit: the altimeter in the image above says 33 960 feet but Christiaan informed me that it has a small error and they were flying at FL 340]. The aircraft was heading towards a magnetic bearing of 219 deg, which corresponds to a true bearing of 204 degrees (towards the S-SW). 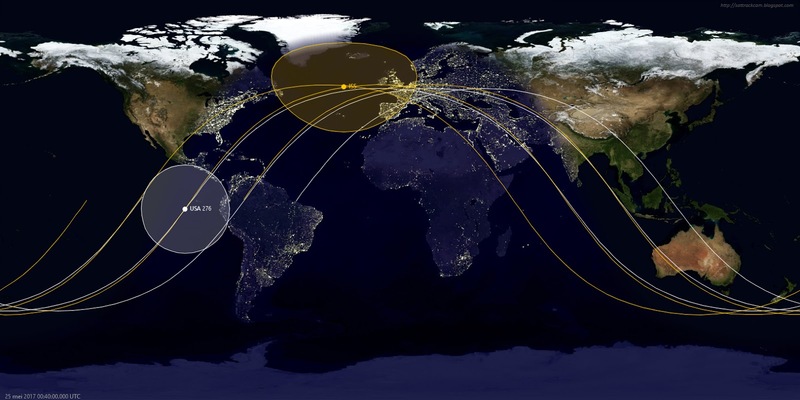 The time and position are very close to that of the TIP: a difference of about 425 km between the TIP re-entry location and the location of the aircraft, and 1-2 minutes in time. There is a discrepancy, in that the observed trajectory is some 11 degrees lower in the sky than the predicted trajectory, with a time lag as well. However, this is what you expect. 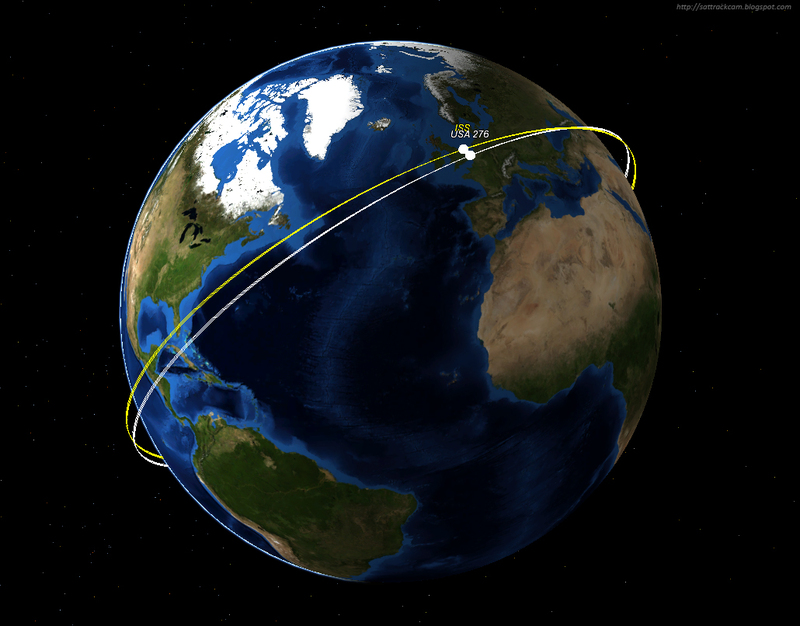 The track shown is for the pre- re-entry orbital altitude (about 134 km). 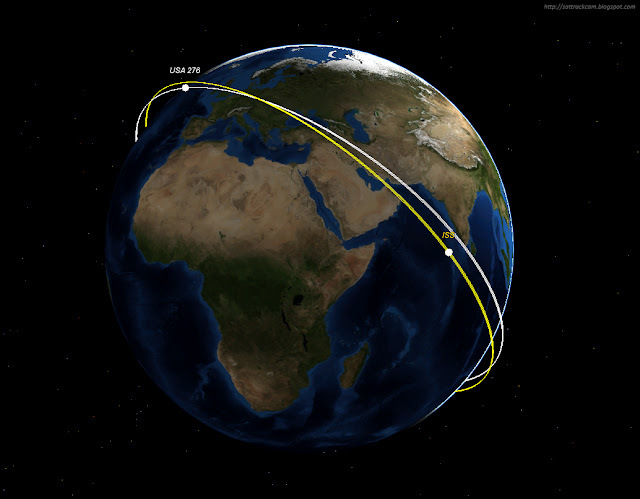 During the re-entry phase, the altitude of the object however quickly drops, and as a result the observed track will be located significantly lower in the sky. As the object is slowed down by increasing drag of the atmosphere, it starts to lag behind predictions in time as well. At the time of the re-entry, the object was already below 80 km altitude, 40% or more below its orbital altitude. As can be seen, the modelled sky trajectory, while not a perfect fit, is nevertheless very close to that visible on the photographs. 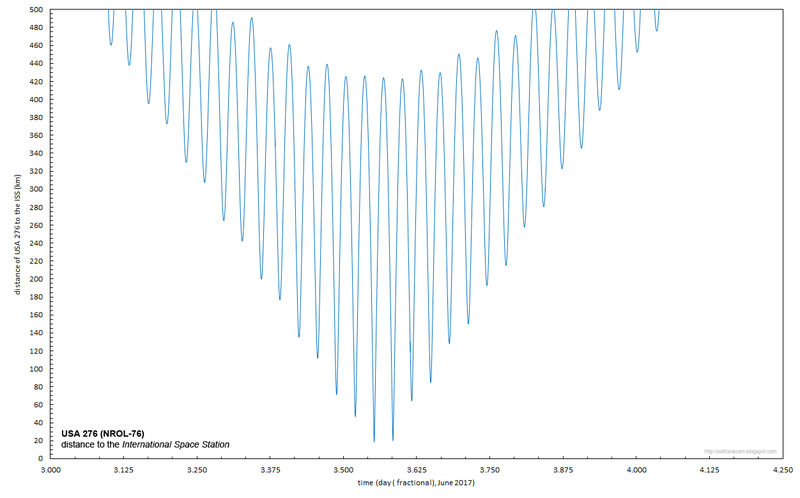 Note that the GMAT reentry model, while modelling the influence of the atmosphere, does not take fragmentation and ablation (and from that mass-loss and changes in surface:mass ratio) into account. To gain insight into the positions and altitude of the re-entering debris over time relative to the aircraft, I have modelled the re-entry event. I propagated the last five known orbital element sets (TLE) for 2014-049C to its last ascending node passage before re-entry, using SatAna and SatEvo. 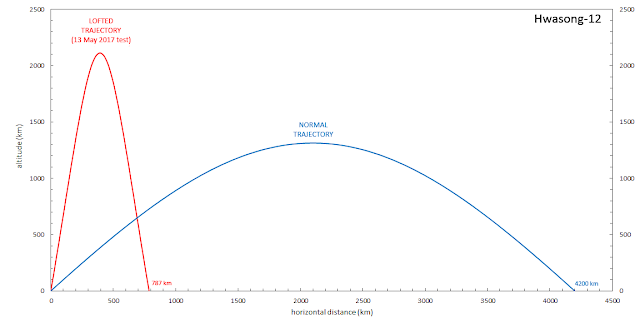 The resulting, final, pre- re-entry TLE was next used as the starting point for a ballistic simulation in GMAT, using the MSISE90 model atmosphere and actual Space Weather data. 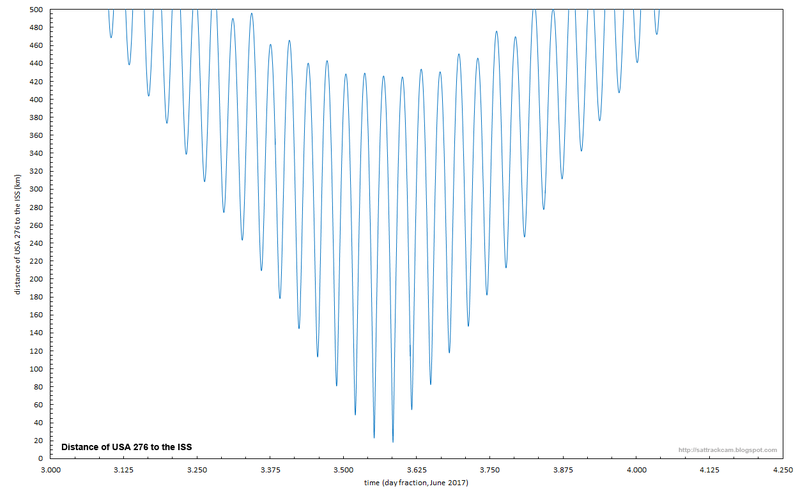 With this input, I had GMAT calculate positions and altitudes of the re-entering object over time. Such modelling always is an approximation only. There are a number of unknowns, one of which is the spatial orientation of the major axis of the re-entering rocket stage with regard to its flight direction. This adds uncertainty to modelling the atmospheric drag experienced by the re-entering rocket stage, which introduces uncertainties in the position and altitude of the stage for a certain time. A CZ-4B 3rd stage is a tube measuring 6.24 x 2.90 meter with a dry mass of about 1 metric ton. The drag experienced depends on whether its longest dimension is facing the flight direction, its narrow end, or whether it tumbles. For the modelling, I choose to use a drag surface that is 50% of the maximum drag surface possible. Breakup of the rocket body, which is evidently happening (see the copious fragmentation in the photographs) adds more uncertainty, as fragmentation drastically alters the drag surface and surface-to-mass ratio. As the images show, the trajectories of individual fragments clearly start to diverge as a result of this. The model, however, treats the re-entering body as one single body with no mass loss. 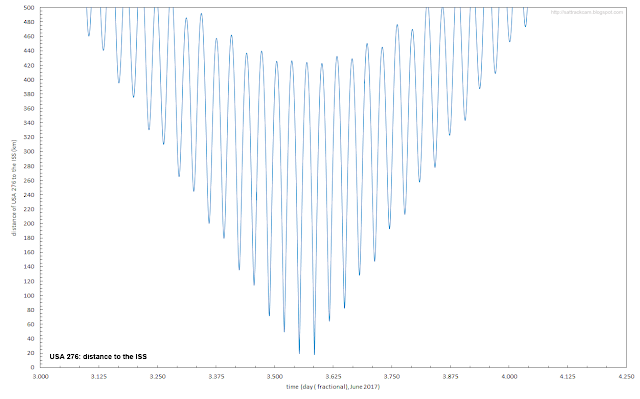 For the reasons mentioned above, the altitudes versus time in the diagram are approximations only, with a possible uncertainty of perhaps 25% for a given time instance. Compared to the JSpOC TIP data, the resulting trajectory I modelled seems to be slightly on the 'early' side, in that it passes the JSpOC location about a minute too early. On the other hand, the time in the TIP is given with an accuracy of no better than 1 minute, and an unspecified inaccuracy in the coordinates of the geographic location as well. What we can conclude from the modelled positions relative to the aircraft, is that the sighting definitely matches the 2014-049C re-entry data closely. If my modelling is somewhat correct, the re-entering debris was moving from altitudes of ~95 km at the start of the sighting to below 50 km near the end [update 6 Oct 2017: The closest it came to the aircraft was a line-of-sight minimum distance of 157 km near 23:16:50 UT]. It is uncertain whether anything survived to sea level c.q. aircraft flight level. Usually, most materials have burned up before they could reach the surface: it is however not impossible that some pieces nevertheless survived and splashed down in the Atlantic. Notably the pressure spheres of rocket engines tend to survive. If anything, the modelling shows that any surviving debris was well ahead of the aircraft once it reached the flight level of the aircraft. Ted Molczan has done a similar modelling with similar results. The differences that do exist between Ted's analysis and my results, are due to the choice of slightly different starting parameters for the model. 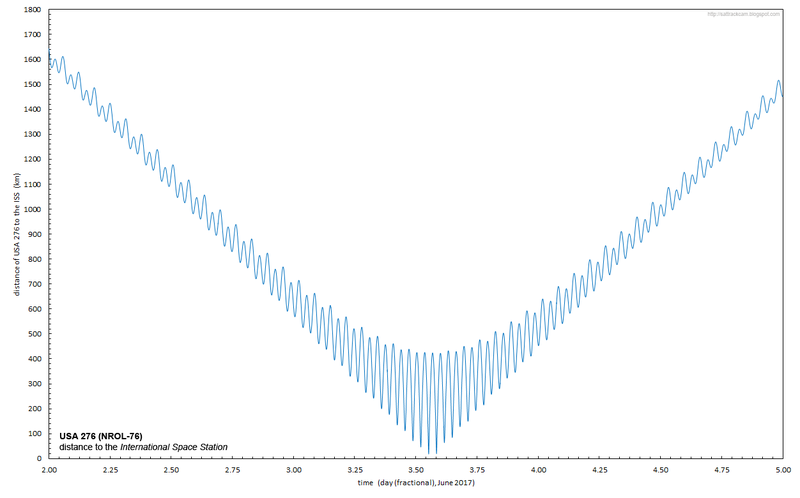 The quick decay of (notably) the apogee altitude, but also perigee, can be clearly seen. Early 2017, the drop in altitude starts to increase exponentially. At 23:17 UT on 27 May 2017, after 15772 revolutions around the planet since launch, it was the final end for 2014-049C. Christiaan asked me why there was no NOTAM issued for this re-entry. NOTAMS or Area Warnings are however generally only issued for controlled de-orbits, and first and second stage splashdowns during launches. Reasonably accurate locations can be predicted in advance for these. For uncontrolled re-entries, such as this event, this is not the case. There are so many uncertainties that anything approaching an accurate prediction can only be issued during the last hour or so before re-entry. (note 1: for some Frequently Asked Questions about re-entries, see an earlier post here). Acknowledgement: I thank Christiaan van Heijst (www.jpcvanheijst.com) for providing extra information and for his permission to use his photographs. I thank Theo Dekkers for pointing me to Heijst's observations. 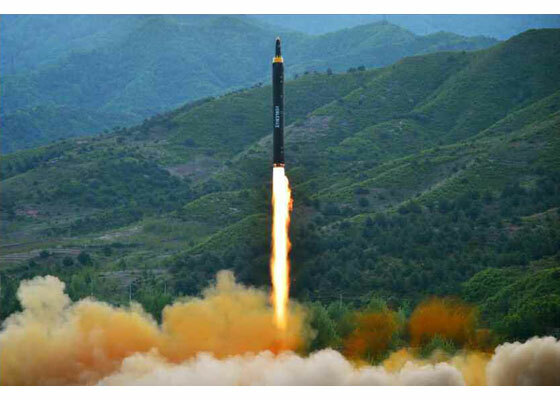 On 13 May 2017 at 20:58 UT (May 14 in local time, just after local sunrise), North Korea launched a new type of IRBM, the Hwasong-12. 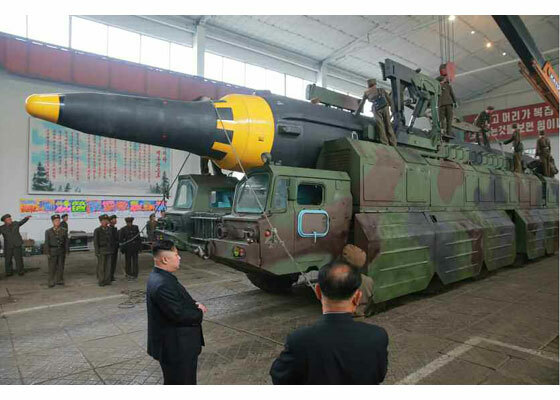 It is probably one of the surprise mobile launcher missiles seen during the April 15 parade. A North-Korean Rodong Sinmun communique on the launch is here. 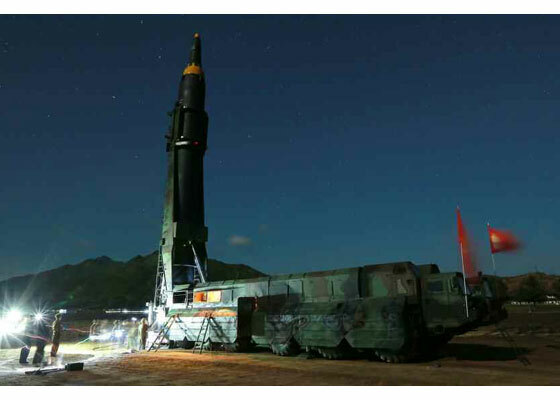 In this blogpost, I try to find the maximum range of this missile, going from released information about the missile's trajectory by Western and North Korean sources. I should ad that my analysis is not original: it is inspired by earlier similar analysis by David Wright on the All Things Nuclear blog and a later analysis by Ralph Savelsberg on the 38 North blog. My analysis was sparked by three things. One was that I wanted to see whether I could reproduce David Wright's results. The second was that I wanted to visualize the situation (I am a visually oriented guy). 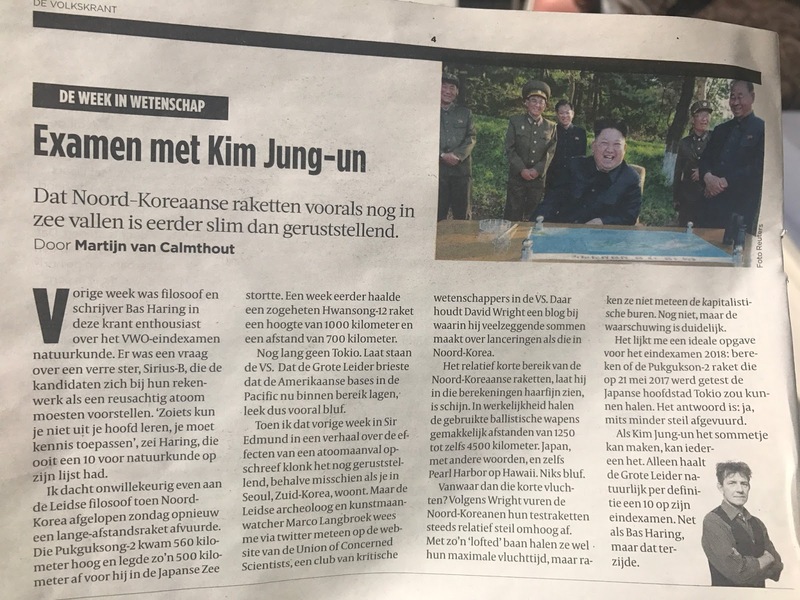 The third was a recent exchange on Twitter between me and Dutch science journalist Martijn van Calmthout of the Volkskrant. 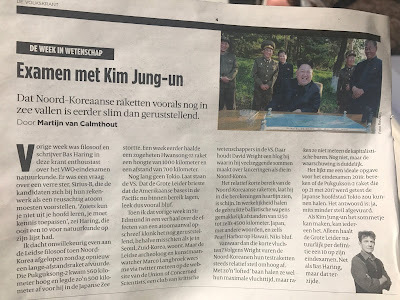 He had written a newspaper piece on North Korea's recent missile and atomic activities that seemed to underplay the significance of the May 13 test, choosing wording to suggest North Korea could not reach Japan with this missile. I then pointed him to David Wrigth's analysis. 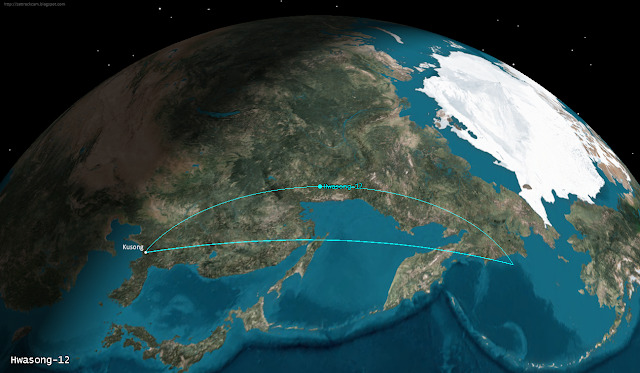 As pointed out by David Wright, the May 13 test missile was not launched on a standard trajectory but on a so-called 'lofted' trajectory: North Korea released info that the missile travelled a ground distance of 787 km and reached an apogee altitude of 2111.5 km. Western military sources quote similar figures, so I see no reason to doubt them. Such a lofted trajectory brings the missile very high and shortens the ground track. 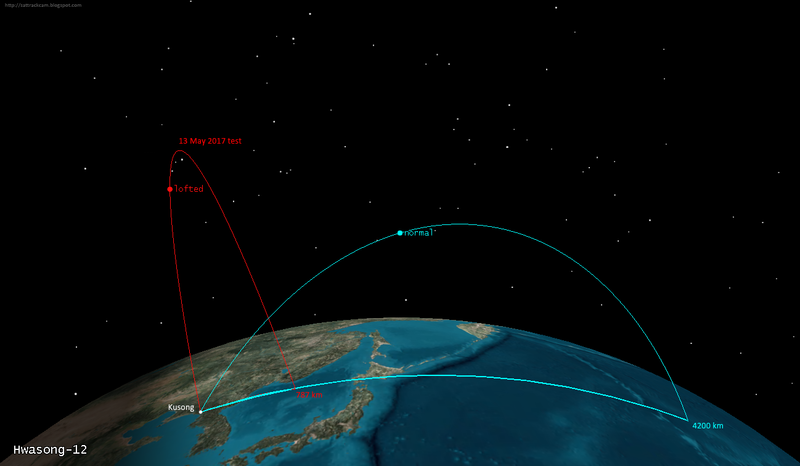 Fired on a more normal trajectory, the same missile with the same impulse would fly a much larger ground distance. A more normal apogee altitude for a missile like this is 600 to 1300 km. The reason that North Korea choose this 'lofted' trajectory, is in order to avoid that the missile overflies neighbouring countries, which could be mistaken for an attack and might evoke countermeasures. South Korea, Japan (for obvious reasons) don't like it when North Korea fires a missile over their territory. 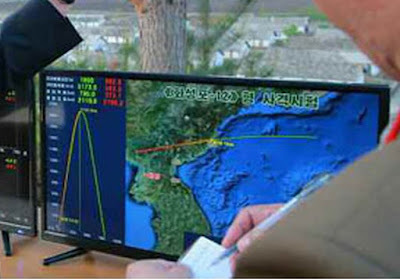 The 13 May test missile was launched from Kusong in the western part of North Korea, into an E-NE direction overflying North Korea and then onwards over sea. 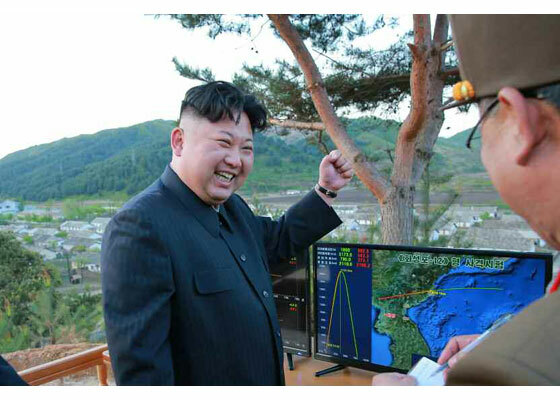 As part of the photographs released by North Korea after the test, an image was released showing Kim Jong Un with a map of the missile's trajectory. Based on that map, I estimate the impact point of the missile to be near 41.64N, 134.27 E, which indeed is ~787 km from Kusong (I have taken the airport near Kusong as the launch location). This is a bit further away from Vladivostok than earlier reports suggested: about 250 km. Of course these could perhaps be the intended test results rather than the true test results. I used these parameters (estimated impact point, 2111.5 km apogee altitude) as input in STK in order to model the trajectory. It suggests that the missile delivers an impulse of 5.59 km/s. The launch was towards azimuth 72.5 degrees under an angle of 81 degrees, almost vertically. 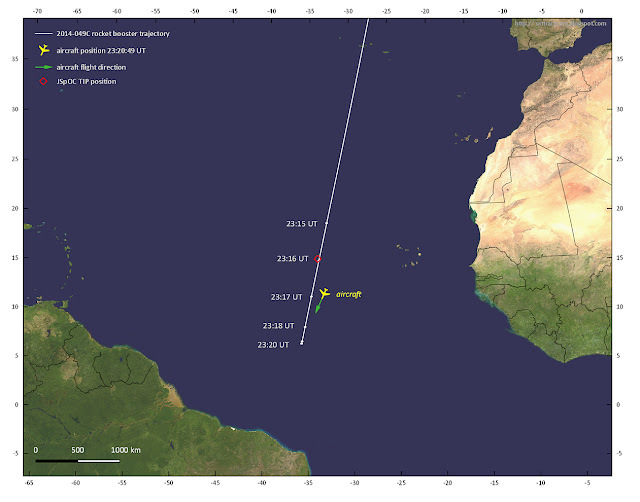 The resulting time of flight would be 28 minutes, very close to the ~30 minutes reported by western sources.The resulting trajectory is (as it should be) very similar to that on the photographs above. The red line shows the 'lofted' trajectory from the May 13 test. The blue line shows the trajectory the same missile with the same impulse would travel using a 'normal' launch angle. The resulting maximum range I get is about 4200 km (with an apogee altitude at ~1300 km) - close to Wright's original figure of 4500 km, somewhat less than his later revised figure of ~4800 km, and slightly larger than Savelsberg's 3700 km. Given the uncertainties, all results mentioned are in the same ballpark figure. 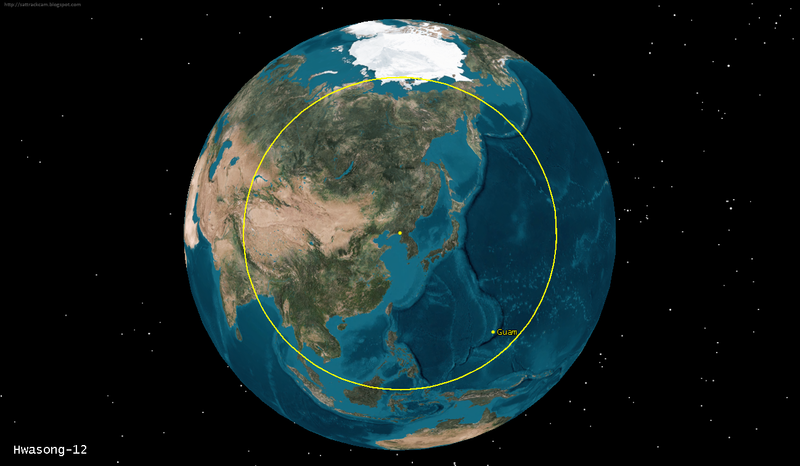 This range circle reconstructed for the Hwasong-12 includes Japan, almost the whole of China, east Russia and the Phillipines. The US bases in Guam would also be in reach, i.e. this means that in theory (and if North-Korea has developed a working re-entry vehicle to match the missile - interestingly, their Rodong Sinmun communique mentions that the test also verified "the homing feature of the warhead under the worst re-entry situation") North-Korea would have the power to strike US bases outside of South Korea with this missile. Outside of Hwasong-12 reach would remain Hawaii and the US mainland: the 4200 km range falls just short of reaching Alaska. Edit: The actual range of a missile depends on several parameters. One of these is what you put on it, i.e. the warhead used. The STK analysis is also slightly simplified as it treats it as purely ballistic and ignores atmospheric drag during initial launch phase and reentry. Last night was very clear again. I observed two passes of the new USA 276 (2017-022A) satellite, also known under its NRO launch number NROL-76. It was launched early this month by SpaceX, and I wrote in detail about this mystery payload in my post from yesterday. 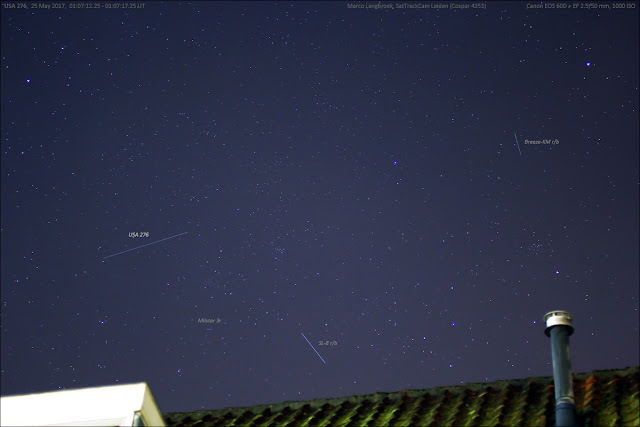 The image above, taken with a Canon EOS 60D and EF 2.0/35 mm lens, shows the satellite passing over the roof of my house during the first pass (00:36 local time, 22:36 UT). It was bright and an easy naked eye object at mag +2.5 near culmination. During this second pass, I visually seemed to note some brightness variation, notably after culmination. Analysis of the pixel brightness of the trails in my imagery seems to confirm this. They show an irregular brightness variation, notably in the third image (the last of the images above), that looks like it is a combination of several periods. The diagrams below show the curve obtained from 4 images, and a detail curve of the third image where brightness variation seems most pronounced. Pixel values of the trails were measured with IRIS. This variation could hint at some form of spin stabilization, or alternatively the presence of some rotating element perhaps. I did not note this variation during earlier passes, so it could perhaps strongly depend on the viewing angle. 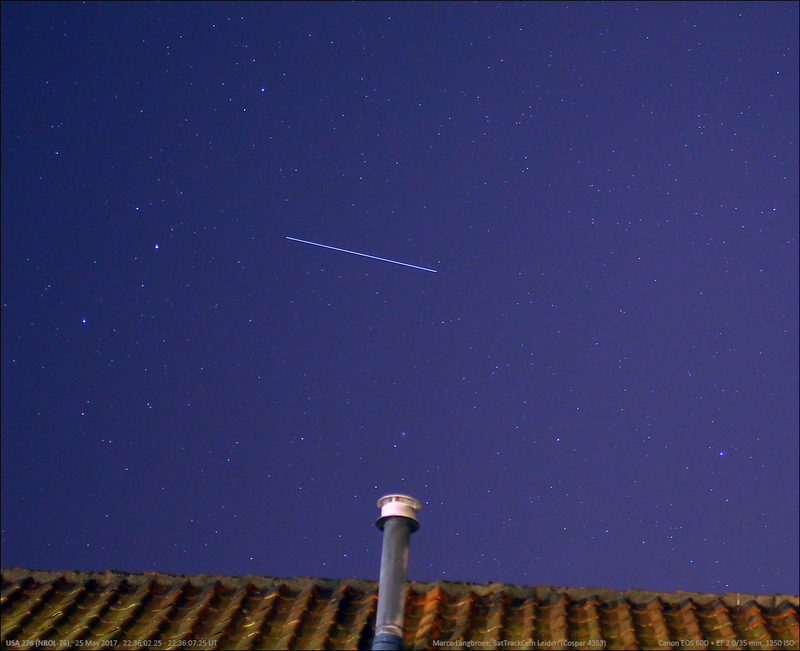 The image above shows USA 276 passing over the roof of my house last night. USA 276 is the mystery payload of the May 1 SpaceX NROL-76 launch from Cape Canaveral. 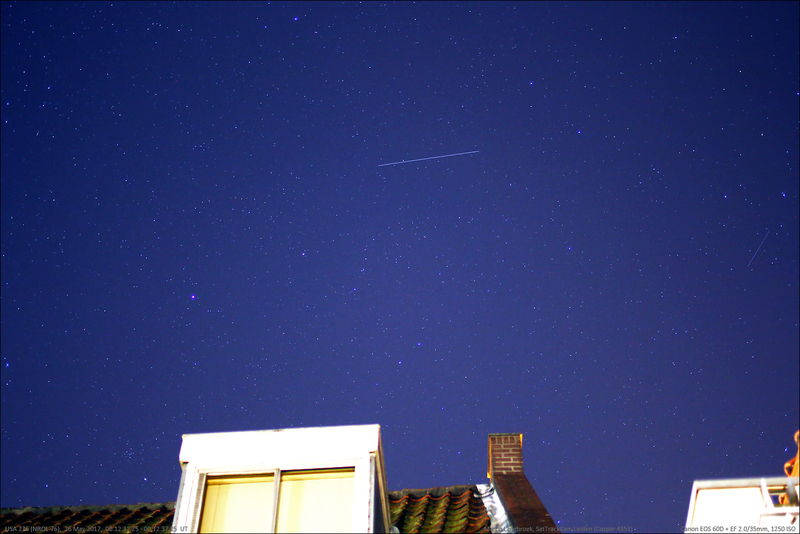 USA 276 was quite faint during the first pass (I could not see it by naked eye from Leiden town center). During the second pass it was brighter, attaining mag. +3 near culmination, visible to the naked eye without problem. Due to its low orbital altitude it was very fast: the object is in a 389 x 409 km, 50.0 degree inclined orbit. After its May 1 launch, there was a lot of discussion among our observers. The launch azimuth seemed to suggest a 50 degree orbital inclination. That would be odd (see below), so not everybody was willing to believe this. Some suggested a dog-leg manoeuvre towards a 63.4 HEO orbit. Because of the lack of precedent, orbital altitudes could only be guessed, making a quick recovery by observers more troublesome. 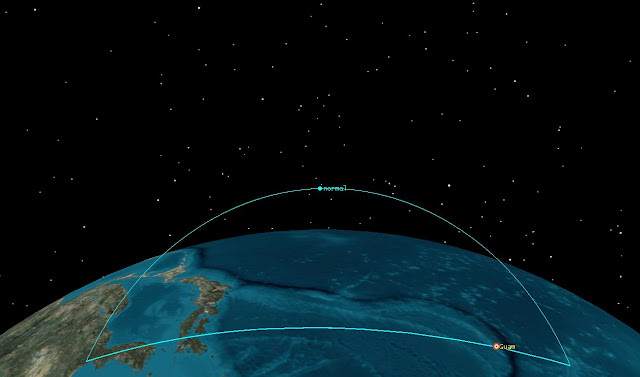 It took a while (23 days) before the payload was finally observed and the orbit could be confirmed. 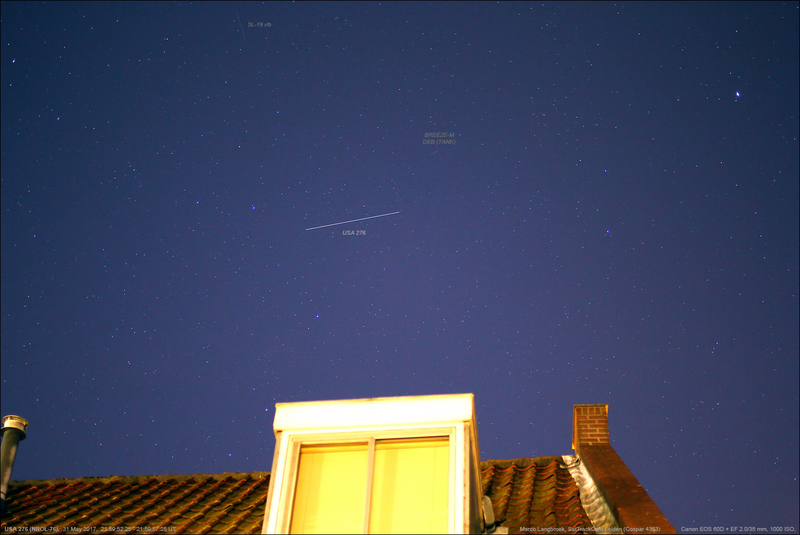 On May 23-24, the night before I obtained the imagery above, Leo Barhorst in the Netherlands finally found the payload. And it was in a 50 degree inclination, 389 x 409 km Low Earth Orbit. The purpose of this payload in this odd orbit is a bit of a mystery. The orbital inclination of 50.0 degrees does not match common orbital inclinations attached to specific functions: US military radar satellites (ONYX, TOPAZ) tend to be in 57 degree LEO orbits or their 123 degree retrograde equivalents; SIGINT sats in 63.4 degree orbits (either LEO or HEO); optical reconnaissance satellites in 98 degree sun-synchronous LEO orbits; the X-37B space plane was in a 39-degree inclined very Low Earth Orbit. An orbital inclination of 50.0 degrees, as shown by USA 276, is odd and unusual. The common opinion is that USA 276 is some technology demonstrator, somewhat similar to the ill-fated USA 193 from 2006, blown from the sky with a SM-3 in 2008. But what technology does it demonstrate? Orbital inclination and orbital altitude are in fact very (some would say oddly) similar to the ISS (see diagrams above and below, showing how close the orbits currently are): the two objects in theory (and based on the current USA 276 orbit) can potentially even make quite close approaches, to within a few km (! ), as Ted Molczan showed in a private communication. I have found that on June 4, USA 276 will in fact be very close by when (if all goes according to plan) the SpaceX DRAGON CRS-11 should arive at the ISS at this date. That is, if USA 276 doesn't change its current orbit before then. 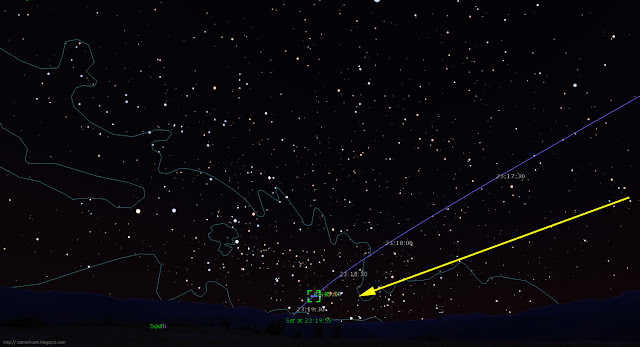 Observers in Europe might see the three objects close together in their evening twilight of June 3, with USA 276 some 15-30 degrees distant from the ISS. Due to slightly different rates of precession of their orbital nodes, the orbits will slowly diverge from their current close coincidence over time, unless USA 276 makes a corrective manoeuvre. I have pondered the question whether this all is coincidental or not. While I can in fact think of a potential goal where this all would be on purpose, that would be a very wild thing to do, so perhaps it is not so likely. For the moment, let's better chalk it up to coincidence until new developments seem to point otherwise. 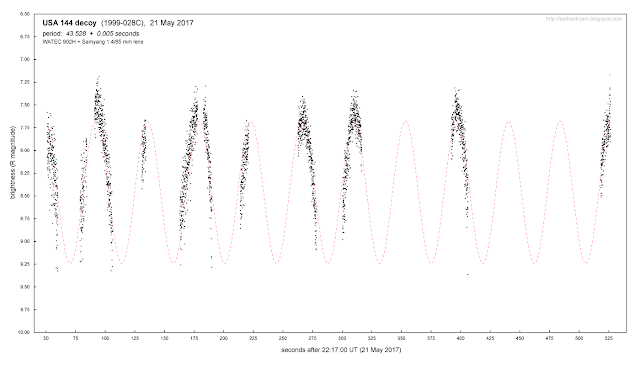 The diagram above shows the brightness variation of 1999-028C, the USA 144 decoy, as determined on 21 May 2017. It was created from photometry on video records spanning several minutes of a pass using a WATEC 902H with a Samyang 1.4/85 mm lens. The photometry was obtained using a not-yet-public beta-version of TANGRA. 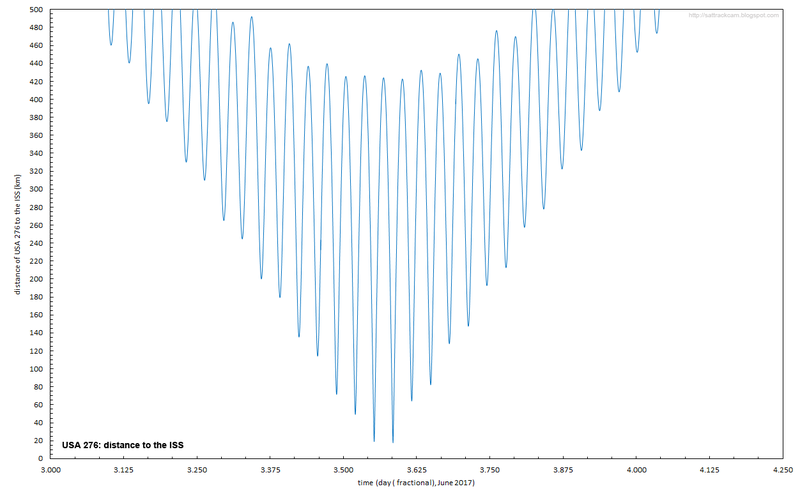 The brightness of the object shows a slow variation between mag +7.2 and invisible. 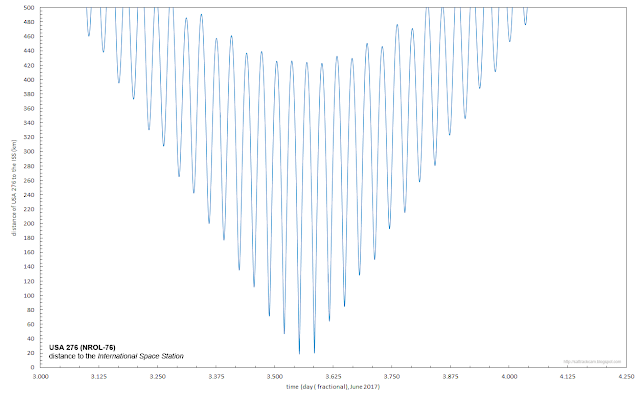 Fitting a sinusoid gives a peak-to-peak period of 43.528 seconds, +/- 0.005. I have written on this enigmatic object before on this blog. It was launched from Vandenberg 18 years ago, on 22 May 1999, as NROL-9. This launch is widely believed to have launched the second Misty stealth satellite. Following the launch amateurs found this relatively bright object in a (currently) 2668 x 3150 km, 63.4 degree inclined MEO orbit. 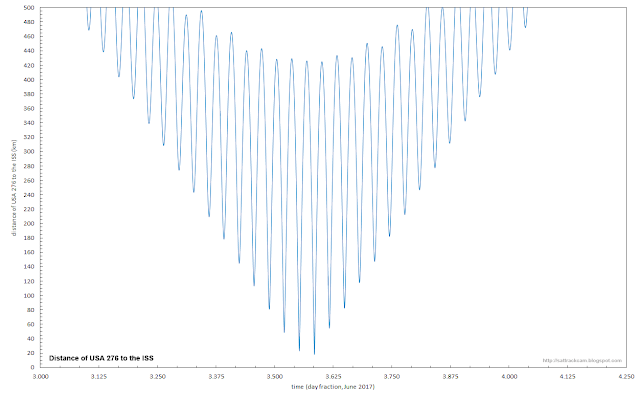 The object shows a periodic brightness variation. This object is, however, not Misty 2. A long term analysis by Ted Molczan showed that the object has an unusually large surface-to-mass ratio in the order of 0.09 m2/kg and its orbit is subject to considerable Solar Radiation Pressure (SRP) effects. The surface-to-mass ratio is an order of a magnitude larger than for normal satellites, suggesting this is something large and lightweight - e.g. something inflatable, so large and light that pressure from sunlight has an effect on its orbit. We have come to believe that it is a decoy, designed to lure attention away from the real, stealthy USA 144 payload when it was launched in 1999. As the result of SRP influence, the tumble rate is variable over time: in the order of 60-90 seconds 7-8 years ago, 50 seconds 2 years ago (see here), and now 43.5 seconds.